Poor-boy science: should I build my own electrophoresis platform? I want to build my own little electrophoresis gizmo to play with. I did pick up a small tube of powdered graphite and some liquid tape. With this, I should be able to make a waterproof electrically-conducting glue that I can use for the electrodes. I’ve got numerous old “wall-wart”-type power adapters that I ought to be able to use for power supply. The main thing I’m trying to work out in my head before I start trying to actually put this together is exactly how I’m going to arrange it so that I can have either a thin gel or a piece of paper or other fibrous material in between the electrodes so that I can best separate things. I suppose it’s kind of bizarre, but this is actually part of the ongoing Expired JellO� projects. I was wondering to myself what actual changes might possibly occur in a packet of dry gelatin mix over time, and how would I be able to tell?� My previous experiments have shown no indication that there are any easily detectable differences (no obvious changes in taste or texture, no strange eerie glow, no acquisition of superpowers upon eating it…) so I’ll have to look more closely. It occurred to me that just maybe over time the strands of protein that make up gelatin might get damaged by oxidation from the air in the pouch (or do they seal the pouch in a relatively inert gas, like argon or nitrogen?). This isn’t something one can really tell just by looking, obviously. One MIGHT be able to tell indirectly by making fresh and “expired” packets of gelatin with the same precisely-measured amount of water, poured on at the same precisely-measured temperature, and ideally with the same amount of mixing. Believe it or not, there are actually special scientific devices for measuring the firmness of gels like this. The hypothesis would be that expired gelatin might end up “degraded” into smaller strands of protein than a fresh packet, and that this would be reflected in a reduced firmness of the gel, or perhaps reduced water-holding capacity. I thought that if I had a way to subject a sample of dissolved gelatin to electrophoresis, I could then use a protein-staining substance to see how broad of a range of protein-fragment sizes were existent, or perhaps even spot distinct fragments if oxidative damage tended to happen at the juncture between particular amino acids or something. 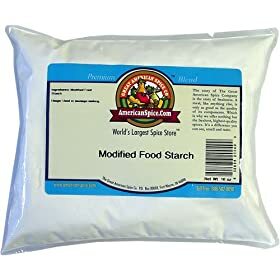 I’m not quite sure why, but I have a strong desire to do this experiment from scratch as a “hillbilly biotech” exercise (including building the equipment and obtaining my supplies from grocery or hardware stores rather than specialty scientific supply places). Then, I ran into a post indirectly about henna over on scienceblogs.com. It seems the natural orange-staining ingredient in henna, called lawsone, may be specifically a protein-staining substance. I’m not certain about this, but a dark-orange protein-staining dye would work for my purposes I think. If so, that solves my need to get a protein stain from an ordinary store. It’ll be a little while before I can try to put this plan into action, but I think I’ll be able to get to it in the next month or two. In other news, I think I’ll try to post my “Microbial fuel cells in 90 seconds” audio sometime tomorrow. Then I can work on more. Anybody want to hear me attempting to explain something in 90 seconds? So far I’ve considered MRSA, and perhaps how cow flatulence threatens the world’s climate (which is also a microbiological topic). I’m sure there must be plenty of other possible topics. Any suggestions? P.S. Who wants audio in Ogg Vorbis format in addition to mp3? Posted on 2007-10-20 Categories Expired JellO®, Feedback Solicitation, Food Science, Grossly Oversimplified Science, Hillbilly Biotech, Me, me, me, Methods, Microbiology, Nerdity, Why Does It Work?Leave a comment on Poor-boy science: should I build my own electrophoresis platform? I awaken. Am I alive? The temperature is neither extremely hot nor extremely cold, so I’m apparently not in some punishment-afterlife. And there’s no beer volcano or stripper-factory, so this obviously isn’t heaven. On the other hand, I am experiencing the usual persistent discomfort involved with waking up early in the morning. On the assumption that Catholic “purgatory” would be more dull, I will assume I am still alive, and had better get up and get to class. 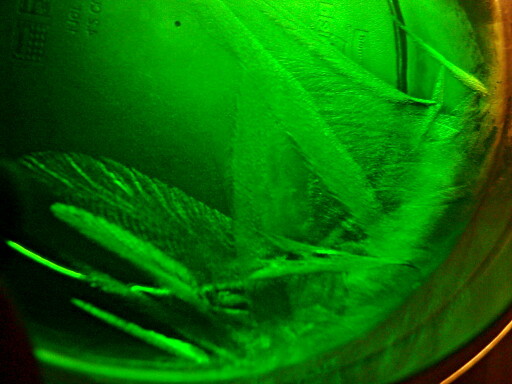 The crystalline-appearing sheets of growth from the edge of the bowl into the gelatin was slightly disturbing. Was I crystallizing something odd out of the gelatin/sugar/flavor solution? The growth resembled infiltration of mold into the gelatin medium enough to slightly worry me. But only slightly. In fact, as I had most suspected, these turned out to be ice crystals. Quite pretty, but they started slowly melting away after the bowl was allowed to sit at room temperature for fifteen minutes or so – plus, they crunched when I ate them just like ice. Thus encouraged, I ate the gelatin and went to bed. And here I am (sitting in the student lounge between “History of Western Art” and “Introduction to Philosophy”) happily blogging away, apparently unharmed. Does this prove that expired instant gelatin is harmless? Well, no, not exactly. Scientists never really “prove” anything. Instead, we attempt to “falsify” our hypotheses and theories as best we can. This is where the concept of the “null hypothesis” comes in. The “Null Hypothesis” here is the situation that, if true, falsifies my hypothesis. In this case, it would be “Expired instant gelatin products from intact packaging will harm me if I eat it.”. However, I did eat expired gelatin products from an intact package and was NOT harmed. Therefore I must “reject the Null Hypothesis”…and therefore my experimental evidence does not fail to support my hypothesis! SUCCESS! If we are unable to find a condition which renders our hypothesis or theory incorrect after many and varied tests, ideally by several different researchers, then we can be confident that our hypothesis or theory is correct, but we don’t necessarily KNOW that there isn’t some odd undiscovered exception that we don’t know about. Two samples (this one and the previous sugarless-orange one) is hardly a large number of trials. This doesn’t prove that expired JellO� is always safe, but since I know of no plausible way by which an intact package of instant gelatin could become hazardous I feel pretty comfortable that expired gelatin from intact packaging won’t harm me. Stay tuned for the thrilling conclusion of this saga…assuming I survive. 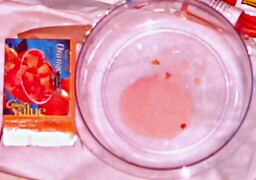 Posted on 2007-09-15 2008-07-01 Categories Expired JellO®, Food Science, Me, me, me, Methods, Nerdity, Play With It, Science Philosophy, Why Does It Work?Tags expired, food, food safety, Food Science, gelatin, JellO, science26 Comments on Expired JellO®! Flee! FLEE FOR YOUR LIVES!!!! I’m still working on the “Taxonomy of Yogurt” post which I currently plan to do next, but I’m overdue for a post already – therefore, here’s a brief one to keep my legion of adoring fans appeased until the next long post, here’s a short one. Part 1: I got an interesting search-query hit recently – looks like (I’m guessing) a technician working at a famous pharmaceutical/healthcare-product company ran into the same problem I did during my current Bacterial Virology lab – “chunky microbiology agar in microwave”. Agar is nifty stuff to use for microbiology. Dried, it’s a lumpy powder. To use it, you dump around 1-2% w/v (more or less, depending on the consistency of agar that you need) into water and heat it up to dissolve it. It’s basically seaweed-JellO� – except it’s not actually affiliated with Kraft Foods nor made of gelatin. Anyway – once it’s dissolved, it’ll cool into a gel. The nice thing is, you can make up a bottle of this stuff and let it solidify, and store it (sealed) for quite a while. 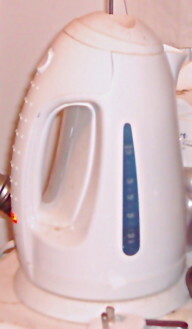 When you want to use it, you can just stick it in a microwave oven to melt it back down. It has to get pretty hot for this, but it then stays liquid until it gets down nearer to room temperature, so you’ve got plenty of time to pour it into plates or tubes or whatever. 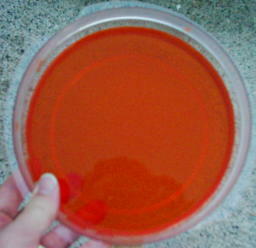 For bacterial virology purposes, we make up a “soft agar” (about 0.8% agar, as I recall) to make an “overlay” – after mixing bacteria and virus together into a small amount of melted [but mostly cooled, so it doesn’t fry the bacteria] agar, we pour the soft agar in a thin layer over the top of a regular layer of nutrient agar in a plate. (The idea is that then wherever there is a virus that can infect and kill bacteria, it’ll wipe out all the bacteria growing in a particular part of the overlay, leaving a cleared “plaque” – you can then count how many plaques there are to find out how many virus were in the original sample, for example). Earlier this semester, we had a fair amount of trouble with this. We’d go to pour the overlay and it’d come out chunky, even though it looked completely melted when we prepared it. Fortunately, the problem is simple and easily solved – you just need to nuke the heck out of the stuff, frequently swirling the container to make sure it’s completely mixed. What seems to be happening is that a few bits of agar remain unmelted but hard to see if you’re not careful, and those bits allow the melted agar to coagulate around them more readily. In short, the trick is to make really sure that all of the agar is completely melted. Note that you have to be careful while doing this – lots of bubbles end up coming out of the agar when you swirl it, and it can easily foam out of the container and burn your hand. (Oh, obviously you also need to leave the lid a little loose to let off the pressure.) Of course, the stuff will be really hot when you’re done with the microwave, but as mentioned before, it’ll stay liquid until it is much cooler before it solidifies. If you set the bottle in a warm-water bath (~50�C or so) you can basically walk away for hours, leave it overnight, or whatever, and it should still be completely liquid and smoothly pourable – not to mention cool enough to handle with bare hands – when you get back. And on the subject of gelled material – the fact that I mentioned all the hits about expired Jell-O� in the previous post seems to have substantially increased the number of “expired-JellO�-related” hits I’ve gotten, so here’s a slightly more expanded update. Assuming one is referring to the “instant gelatin” powders (regardless of brand), as far as I can tell they ought to be safe to use almost indefinitely. Officially, Kraft Foods, the owners of the Jell-O� trademark say that the expected shelf-life is 2 years (“24 months”). I still think, personally (Note – Your Mileage May Vary, Do Not Try This At Home, and other standard disclaimers apply here) just like sugar, that it is probably safe to use practically forever as long as it doesn’t get wet (and isn’t stored in humid conditions). I don’t think anything of consequence would be able to grow on the dry powder, and I find it unlikely that the normal flavorings would be prone to suddenly become poisonous as a result of ordinary aging. The only thing you might have to worry about is maybe some of the flavoring compounds getting slowly oxidized by the air, so maybe the result wouldn’t taste quite the same. 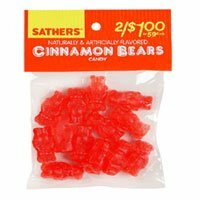 As far as I am concerned, so long as there weren’t fuzzy clumps growing in it, if the contents of the packet were still flaky/powdery, I’d most likely go ahead and use it, and not expect to suffer any ill effects. UPDATE: I empirically test the toxicity of of expired JellO� on my own body! The saga begins here!